I have a great closet full of clothes (117 of them, to be precise ). I live a relaxed and casual life, and would not run out of/wear down my clothes for a couple of years. That means, I have no need to shop for about 24 months, minimum (allowances for undies and etc). But that sounds grim, ladies. A woman does not live by what’s in her closet alone. I am well-stocked with wardrobe basics, like tees and jeans in classic colors. If they do get too worn-looking, I replace them. But there are some statement pieces I just want to get, and play with. And even though there’s no “need”, there’s no law against it either. We are all old enough now to manage our wardrobes in ways that a) please us; b) fit into the budget; and c) have respect for the environment. I like the sleek, simple lines and cool burgundy. These would be great with booties. Jumpsuit. The kind I want is usually in the high-priced designer departments. 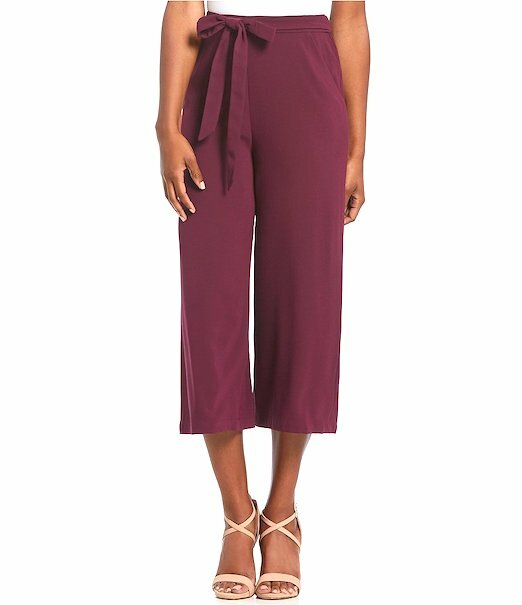 I want one that’s not-waisted, flows well, has a cheeky cropped leg, and in a neutral color. I’ve been scouring the thrifts for one, but no joy yet. 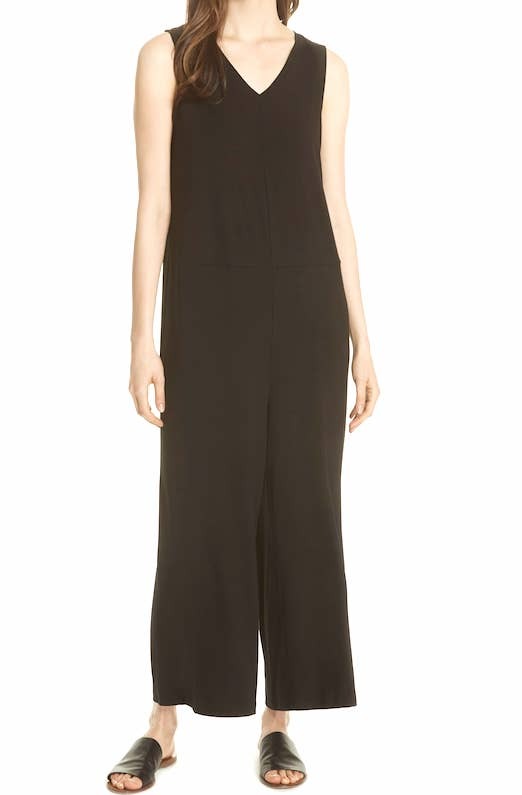 I like this easy one by Eileen Fisher. Bomber jacket. I just started wanting one this year, although I know they’ve been trending for a while. I think the bold-print ones have got me interested. This kind of jacket would take care of 90% of Florida winter. 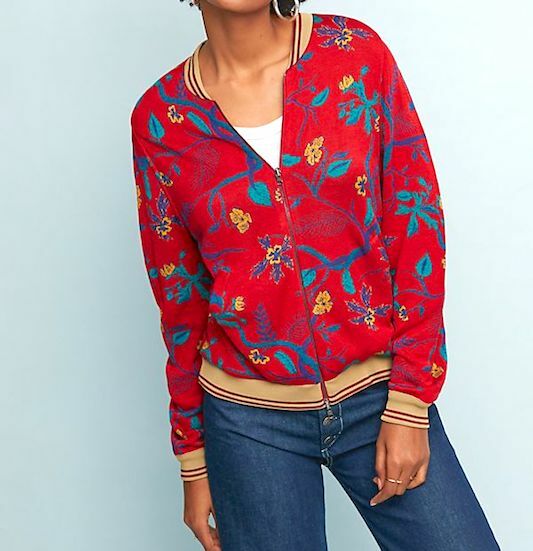 No boring bombers; this one has a strong, rich print. White booties. I have booties in the closet! But not white/ivory ones, and now they’re looking so fresh and mod. I like this strappy pair below, and would also be happy to wear these, these, or these. These are excellent, and on sale. Earrings for my soon to be re-pierced ears. 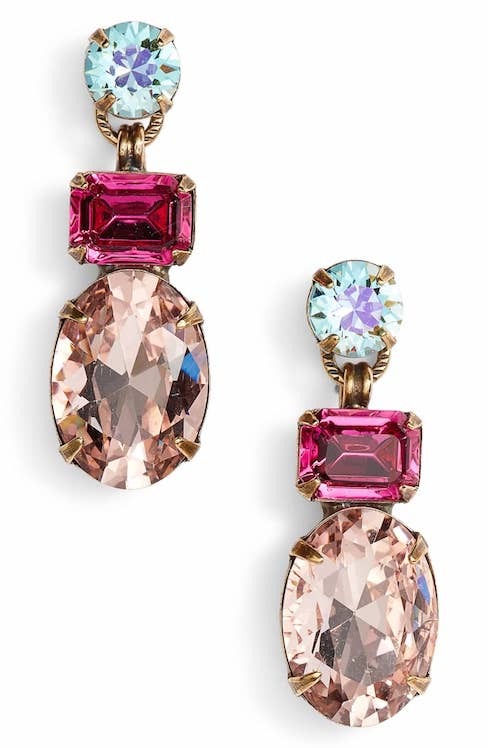 Enough said here; I’ve got plenty of fab earrings waiting to be dangled again. OK, just one new pair. Reminder: Visible Monday starts Sunday around 5PM. You are invited to share your favorite outfit, accessory, hairstyle or lipstick of the week – anything that made you feel Visible. Be there for the best blogger party and the finest style on the webz! Please be aware that links to vendors may be affiliate links. I do benefit from your purchases through the links on the blog. Header image via this site. 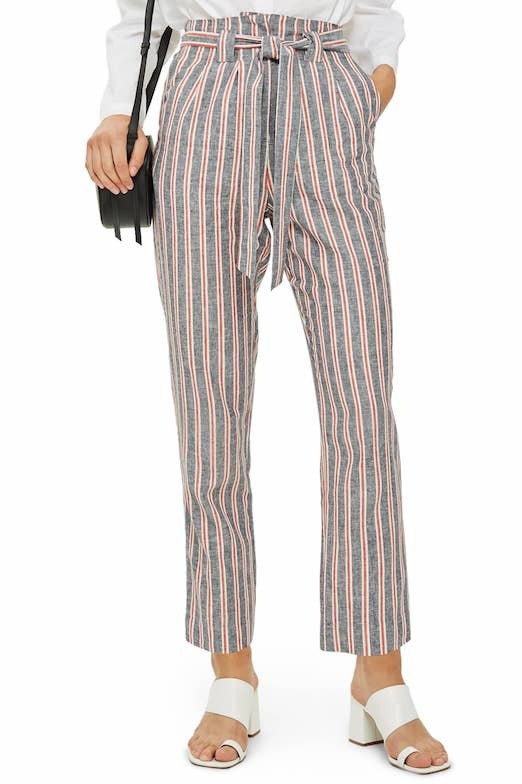 I love all the striped pants I have seen lately. I want some. Also, lately as I have struggled to get all my clean clothes in the closet after doing the laundry. I have told myself “Weed it out, Sue!” Well yesterday I did weed it out and the laundry is almost done but I think I am at a point where if I hang something in the closet and pull it out a few days later it won’t be wrinkled. Yippee! We’ll see though because I still have one load to wash and it is all my clothes, half of which I hang in the closet. I could still weed more from the closet but I just could not part with some of my tops. I don’t need clothes either – but I LOVE those tie waist stripped pants. May have to dig out my sewing machine. I love the length and especially that they actually come up to your waist – that’s so difficult to find these days. Like the jumpsuits too, but I wore one years ago (my mother always said, “save your clothes, they’ll come back in style”) on a transatlantic flight and realized what I had to do when I went to the restroom – and my thought then was “what if this plane crashes, my clothes will all be down around my ankles”. 🙂 Enjoying your blog. The black is back in stock and here is the link. I also reviewed a few of their other pieces over on the blog this weekend. I don’t need a single thing but boy, I could make a list of things I want in no time! Fashion is fun and I just love trying new things. 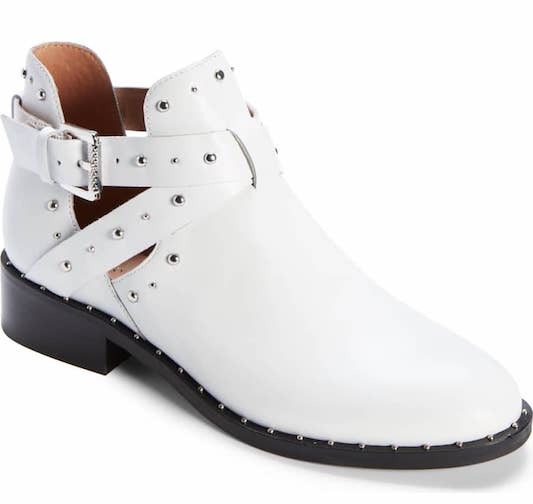 I’m really looking for a pair of white booties that are budget friendly! Remember when I told you I’d never have to shop again for the rest of my life? Ha ha! Yep. Of course with my job I’m faced with temptation every day. There are just so many brilliant pieces to be found when thrifting. Like Oscar Wilde I’m able to resist everything except temptation. Now that I know you want a cool bomber I’ll keep you in mind. I’ve seen loads of them lately. Do you want it to fit oversized a bit? Or more fitted? The items I’ve added to my closet this fall are a rainbow striped sweater, some groovy platform three tone brogues and a pleated skirt, all thrifted of course. Tell me when you are piercing your ears! It’ll put some pressure on me to do the same. I’ve wanted to for so long now. I do remember you saying that! We could have worse habits, yeah?